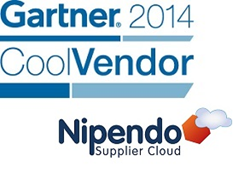 Nipendo, a leading provider of procure-to-pay cloud-based automation platform, today announced its inclusion as a "Cool Vendor" featured in the “Cool Vendors in Integration, 2014” (1) report by Gartner, Inc.
"We believe Nipendo’s selection as a Cool Vendor by Gartner is an exciting recognition of the results we have been able to deliver to many leading organizations through procure-to-pay innovation," said Nipendo CEO Eyal Rosenberg. "While our technology is unique and innovative, at the end of the day what really counts are the business benefits it provides. With automated error-free procure-to-pay-processes, our customers are able to minimize the time and cost of managing buyer-supplier transactions while increasing the level of compliance across all spend categories." Companies using the Nipendo Supplier Cloud have demonstrated success that far exceeds industry standards. “By electronically receiving and processing over 90% of our supplier invoices, IAI is putting to practice the idea of the paperless organization,” said Gabi Ben-Shlush, Head of Accounting at Israel Aerospace Industries (IAI). While electronic invoicing is a good first step, the most significant benefits are derived from automated straight through processing that removes the need for costly and error-prone manual invoice approval and reconciliation. “The Nipendo platform enables us to eliminate close to 100% of all incoming invoices errors, reduce processing time by 80%, and streamline our interactions with the thousands of suppliers we work with,” said David Lugassy from Clalit Health Care, one of the world’s largest HMOs. Nipendo removes the barriers to widespread adoption of electronic communication across the entire supplier ecosystem. With a range of free and low-cost options that fit the needs and budgets of companies of all sizes, connecting to Nipendo’s platform is quick and simple. With no complex customizations, data mapping, or changes to existing business processes, suppliers can onboard and start submitting invoices in hours, instead of the prolonged onboarding process required with competing solutions. Once connected to the Nipendo Supplier Cloud, organizations can electronically communicate and collaborate with all current and future partners with no additional investment, regardless of their ERP system, data requirements, or specific business processes. Nipendo’s buyer-supplier collaboration platform empowers organizations around the globe to reach a new level of procure-to-pay automation that is not just paperless but also errorless and effortless, achieving over 90% straight-through processing of supplier transactions directly to their ERP systems. Nipendo enables seamless interoperability with any supplier communication solution—including EDI, supplier network, and e-invoicing—allowing enterprises to leverage their existing implementations and extend fully-automated electronic procurement and invoicing to the entire supplier ecosystem. For more information visit http://www.nipendo.com. (1) Gartner “Cool Vendors in Integration, 2014” by Keith Guttridge, Massimo Pezzini, Paolo Malinverno, Jess Thompson, May 8, 2014. (3) Gartner “Predicts 2014: Global Procurement Technology Advances Will Drive Billions in Savings” by Deborah R Wilson, Nigel Montgomery, Richard Adams, Magnus Bergfors, November 25, 2013.